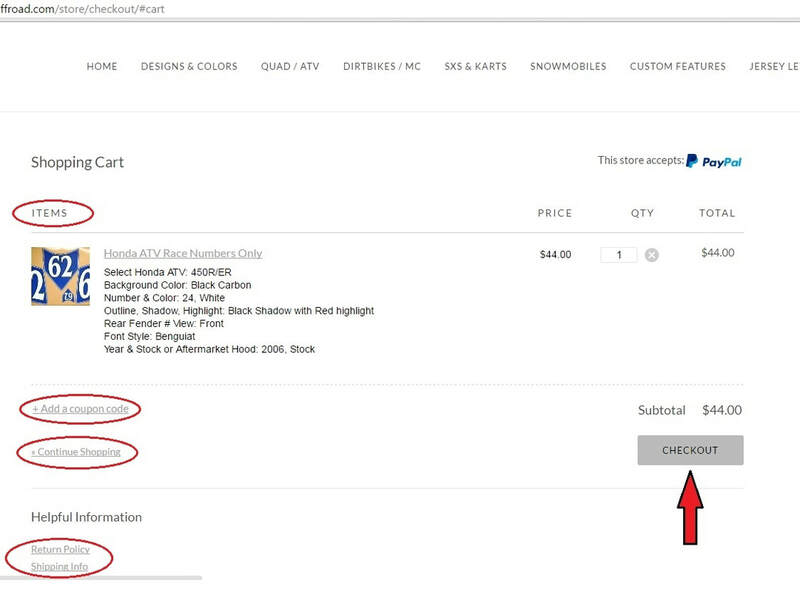 Below are examples of how your shopping cart will look as you go through the online checkout process. Please don't hesitate to call with any questions if the shopping cart is not cooperating with you. Images may be slightly different due to upgrades or revisions within PayPal. 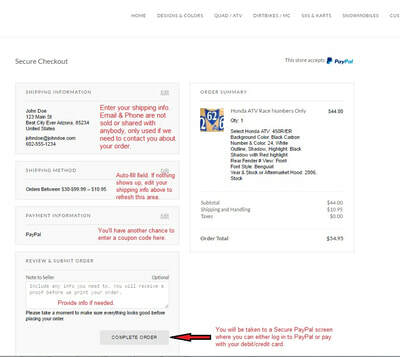 Once your payment is made we will receive an email with your order and you will receive a confirmation email that your order came through. When you shop online through PayPal we DO NOT receive any of your credit card billing info. We only receive your shipping address, your email, and your phone number. Upon completion of your order you should automatically be returned to our site, brmoffroad.com. 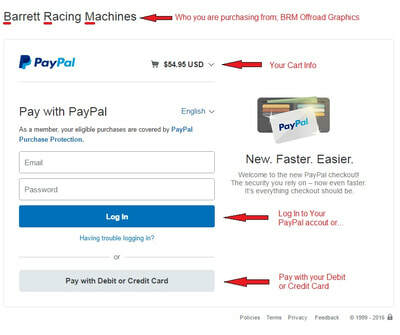 If you call in your order and pay over the phone with your debit/credit card your bank or card statement will show payment was to 'Intuit' or 'Intuit - BRM Offroad Graphics'. Intuit is the credit card processing company for QuickBooks. We proof every order free of charge and do our best to get you a proof within 24 hours. However, during our peak months your proof will be emailed to you within 24-48 hours on business days. Please watch for your email and if you don't see it check your junk/spam folder and give us a call 602-421-0880. Proofs will not be scheduled to print until they are approved and paid in full. Delivery Date is not guaranteed due to circumstances beyond our control (holidays, weather, mechanical failure, carrier interruption, etc). Please email us at brm@brmoffroad.com if you do not see your country on our shipping list, as we're still building our new site. Thank you. We ship USPS Priority and all shipping fees are set by the U.S. Post Office: Basically any U.S. Territory is the same as the States, Canadian orders range from $49.00-54.00 and all other International orders range from $59.00-64.00. All USPS Priority shipping within the USA are 1-3 days in transit. International shipping arrives to the destination country within 5-10 business days, but time in customs is per location. Please call or email if you need to expedite your order with UPS shipping, or if you would prefer to ship via your UPS or FedEx account. All Graphics have a 30 day limited warranty from the original date of purchase for manufacturer's defects only. During the limited warranty period, BRM Offroad will replace, at our sole discretion, any defective, un-used graphic or offer a refund. The customer takes full responsibility for any spelling mistakes after artwork has been approved. Return Authorization is required for all returns. Proof of purchase is required & product must be returned un-used on original backing paper as produced. Produced graphic colors may not be an exact replica of your proof due to your monitor/phone color settings. Consumer is responsible for all shipping costs related to the return or refund. BRM Offroad will not be responsible for improper installation or usage of this product. Flat Rate of $47.95 for most orders. This includes larger sized graphics. Flat Rate of $27.95 for orders that consist of Snocross numbers ONLY due to the size of the packaging we can use (except Polaris 120 Indy Full Windshields, it is too big to fit in the smaller shipping box). Let us know if you need to expedite your shipping with FedEx or UPS, or if you have your own UPS or FedEx account you would like to use.